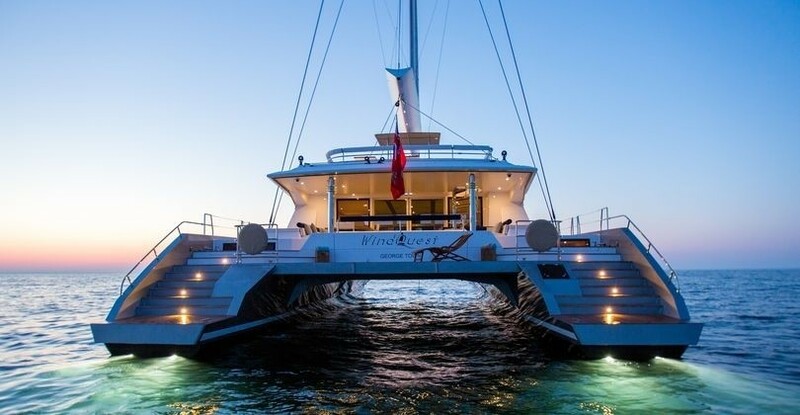 Luxury sailing catamaran WINDQUEST was designed by the well renowned Marc Lombard and built by JFA Yachts of France in 2014. 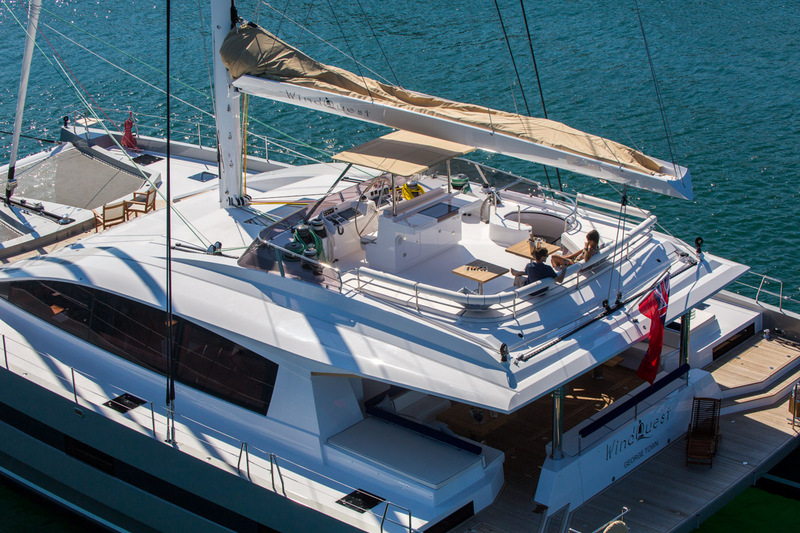 Measuring 26.25m (86.1ft), WINDQUEST comfortably offers accommodation for up to 8 charter guests, in a master and 3 guest cabins, each with private en-suite facilities and double beds. 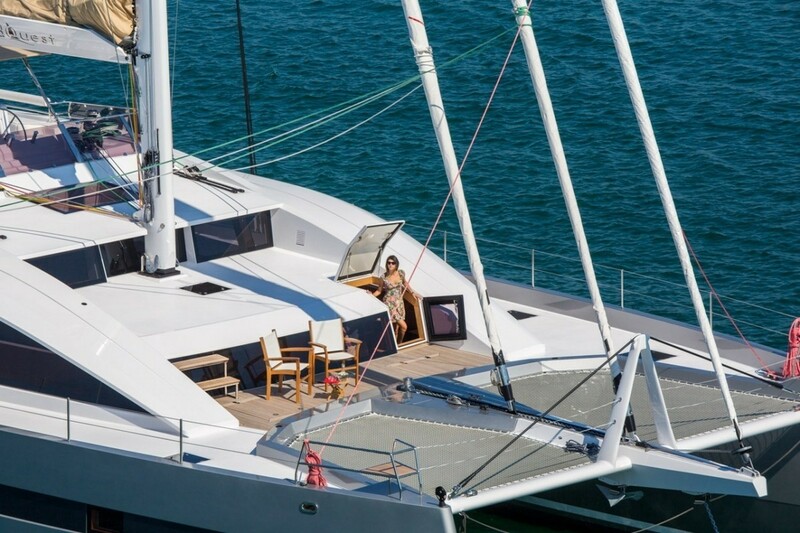 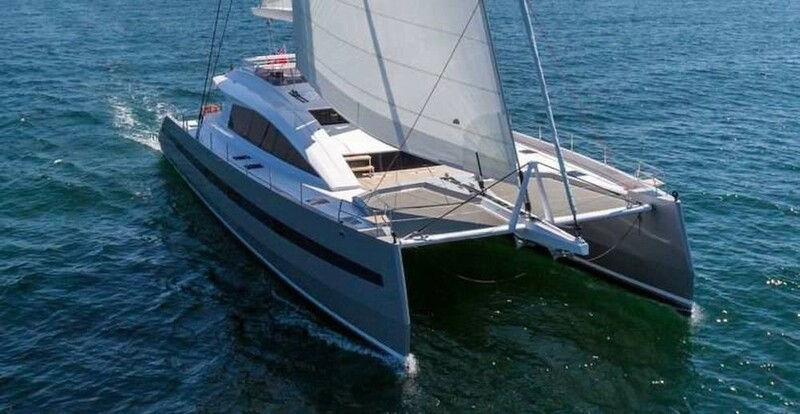 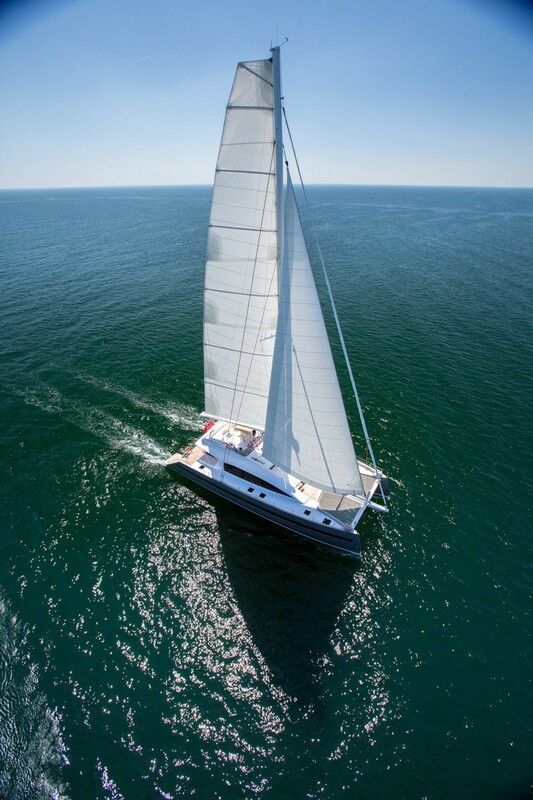 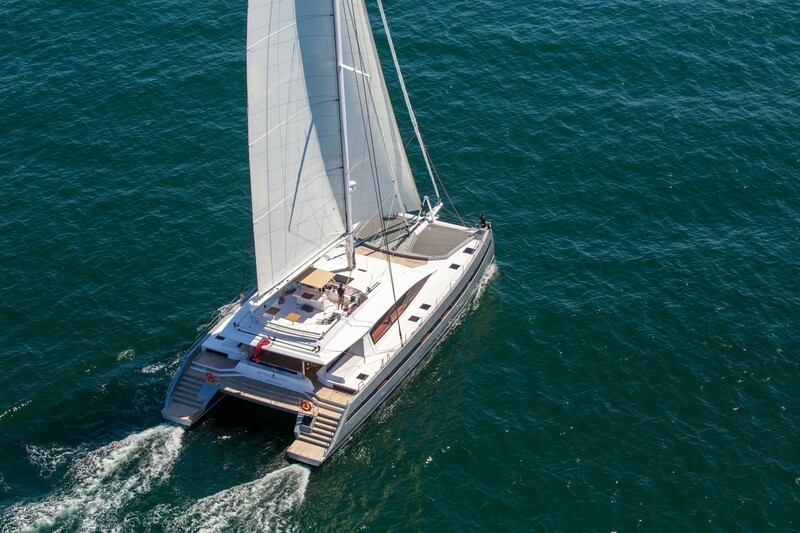 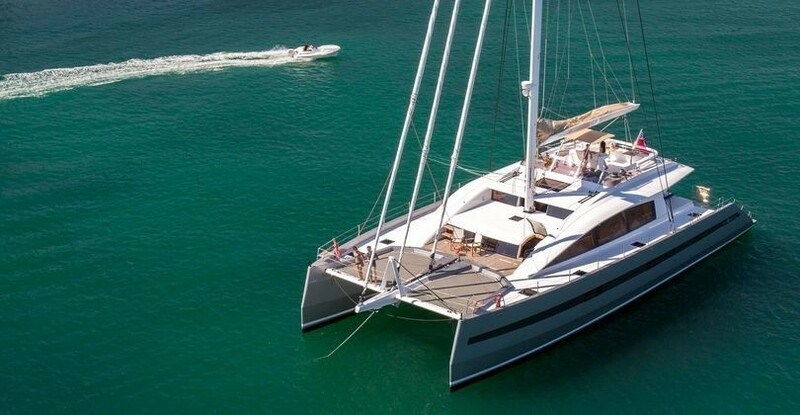 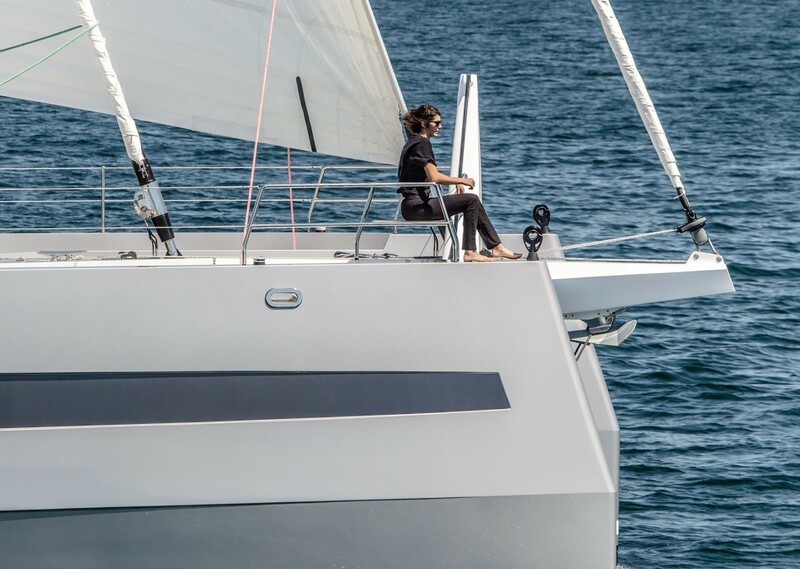 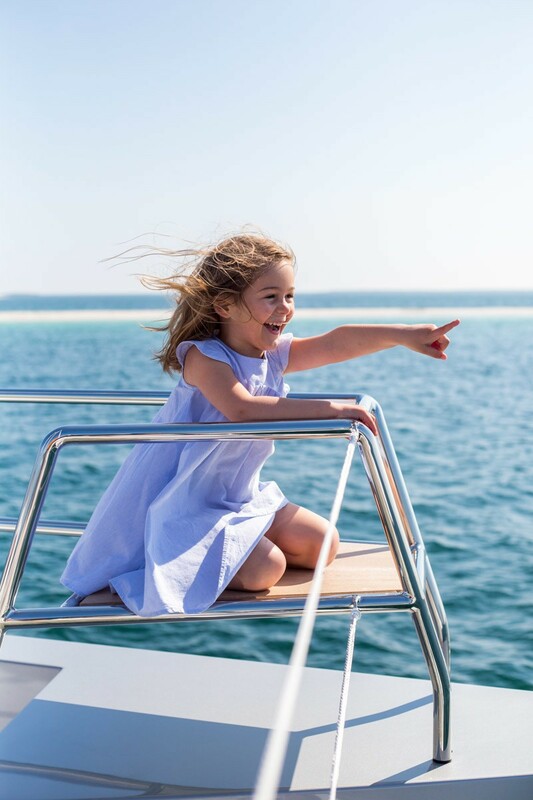 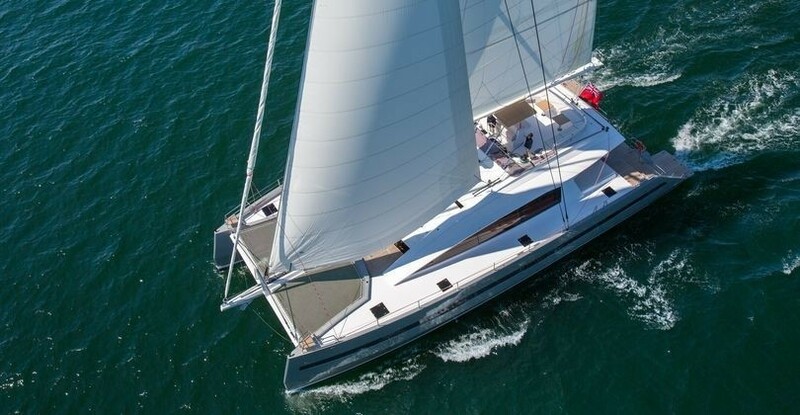 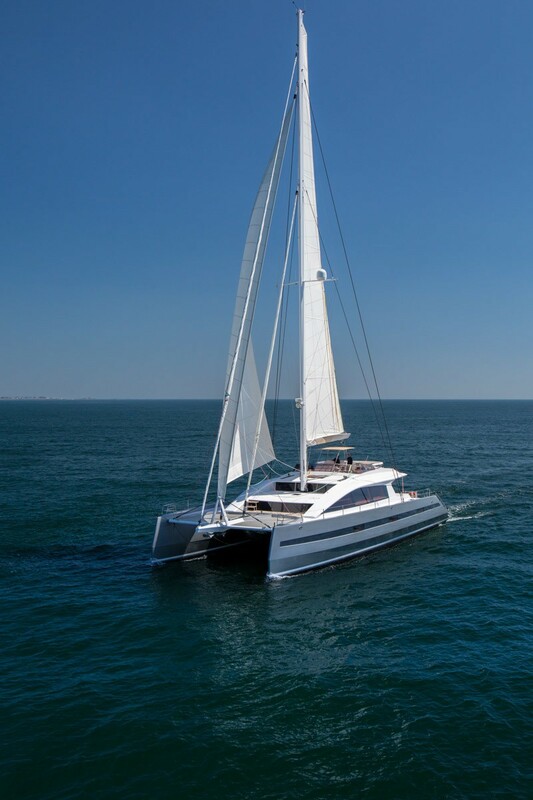 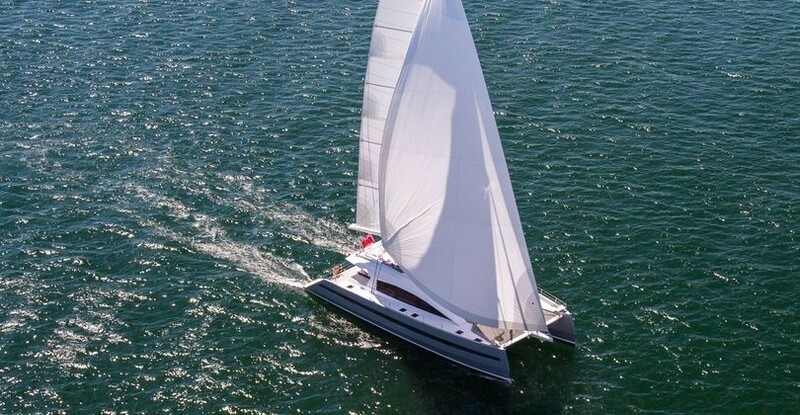 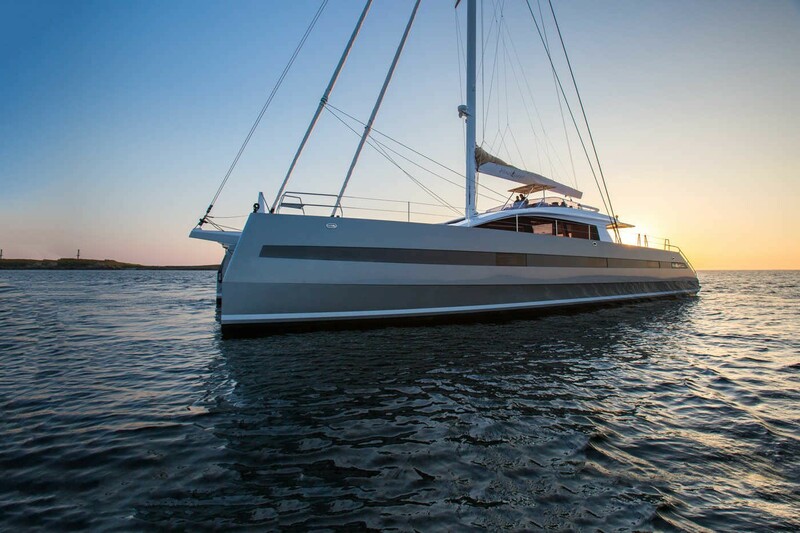 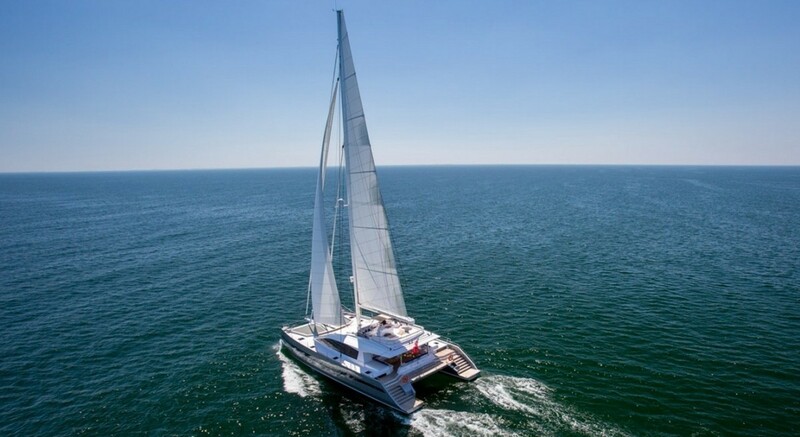 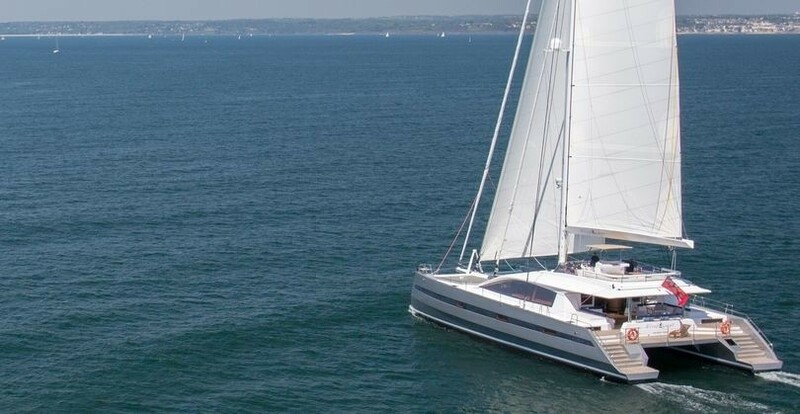 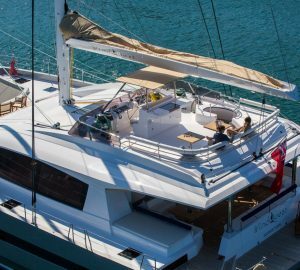 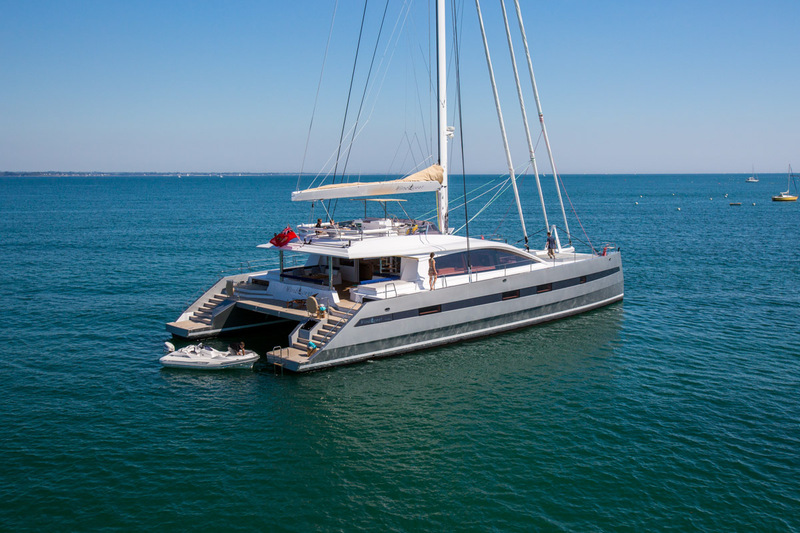 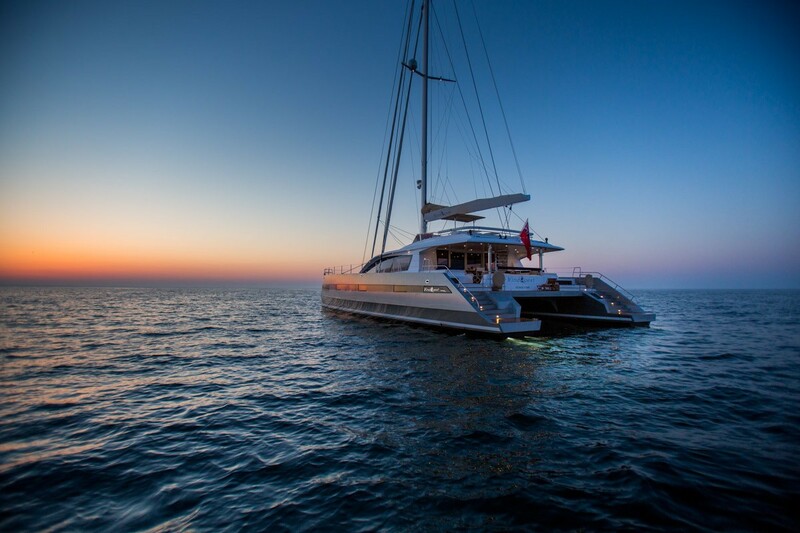 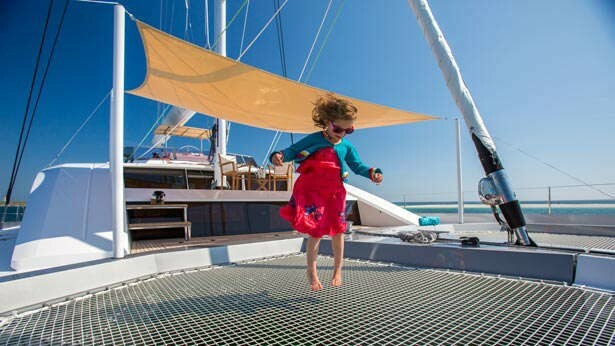 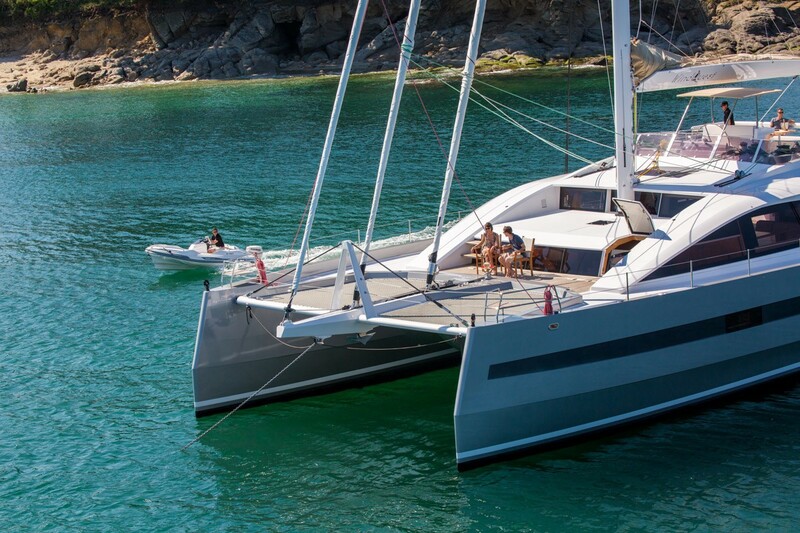 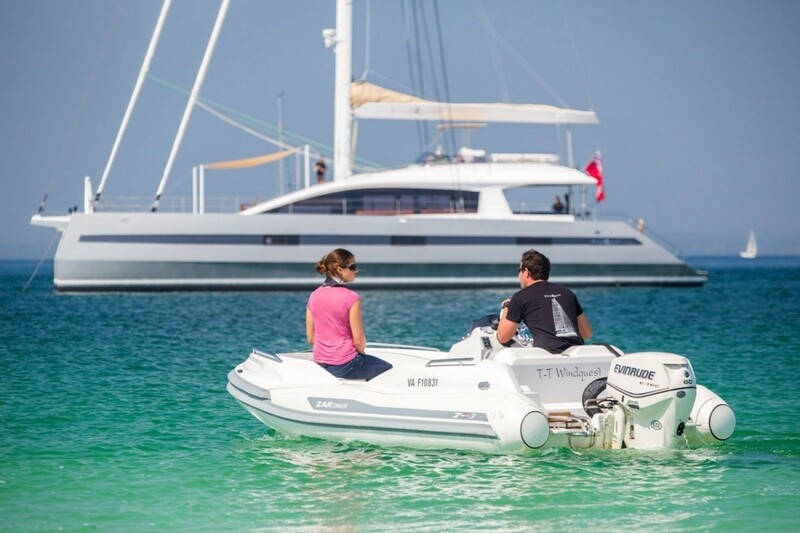 The catamaran WINDQUEST is the perfect yacht for groups and families looking for a luxurious and stable sailing holiday. 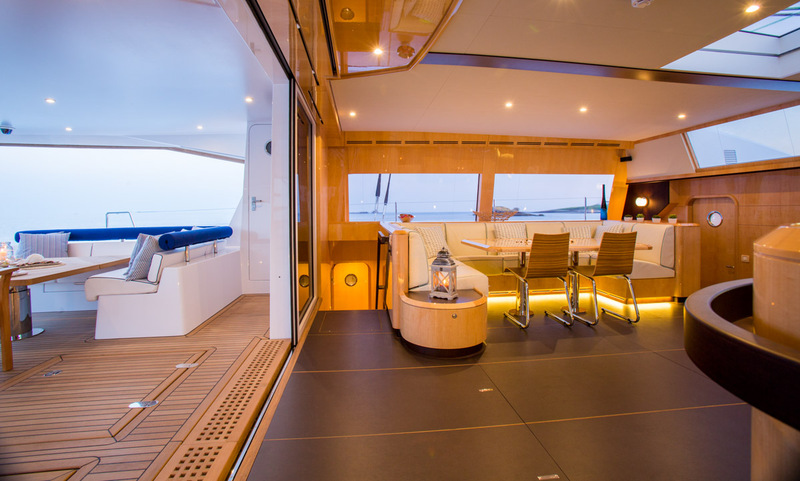 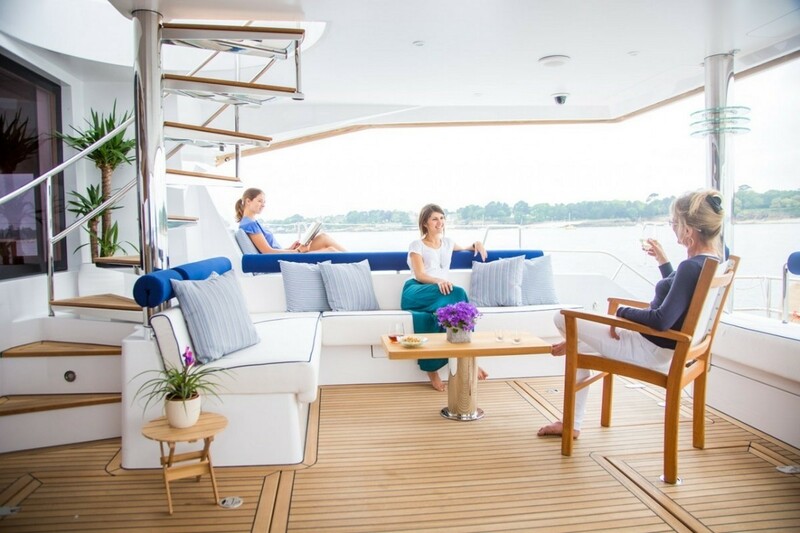 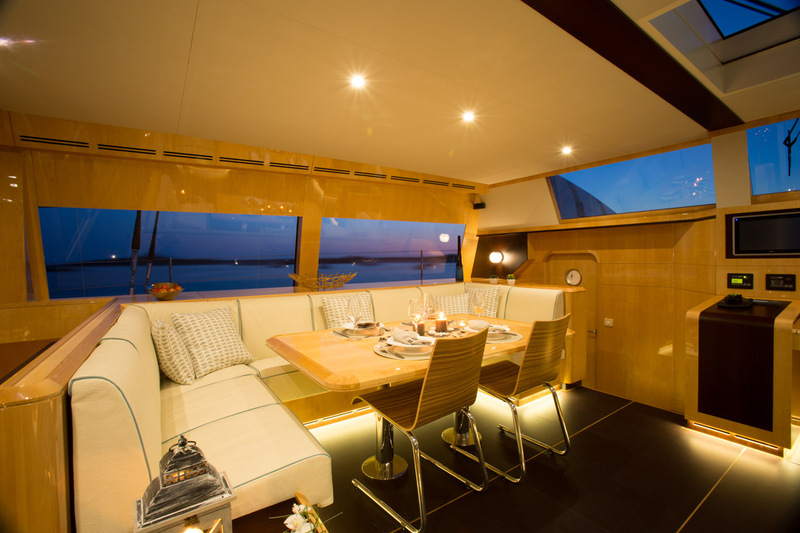 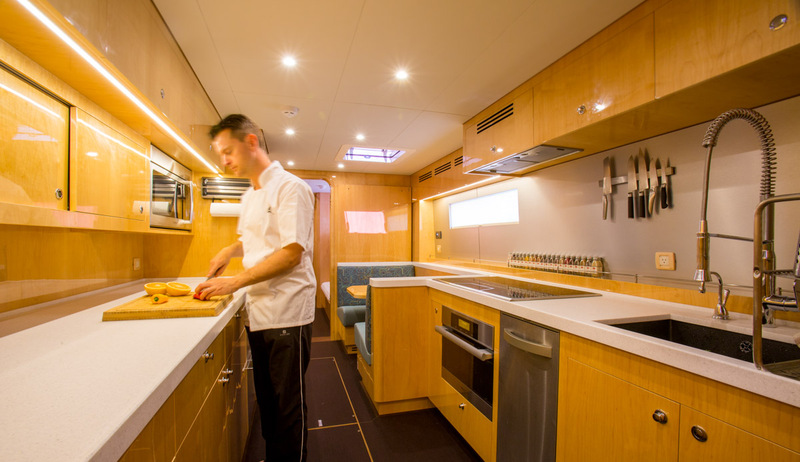 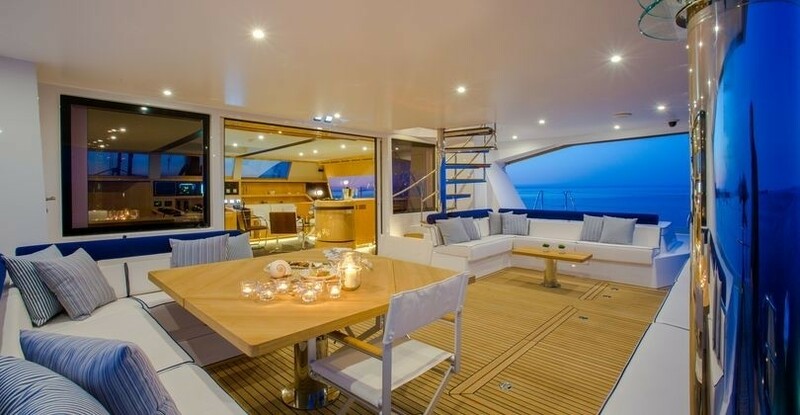 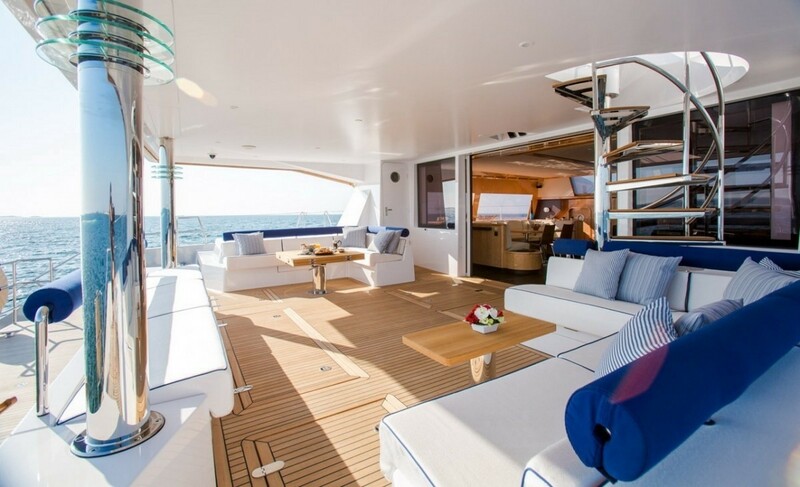 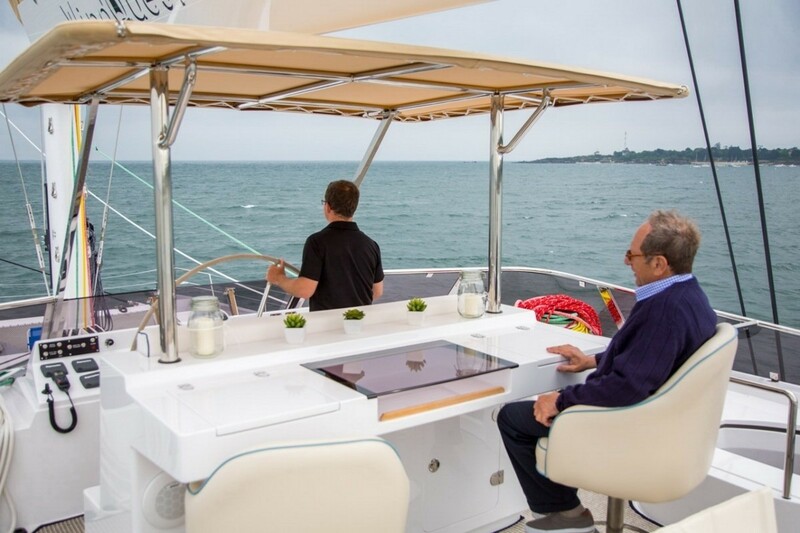 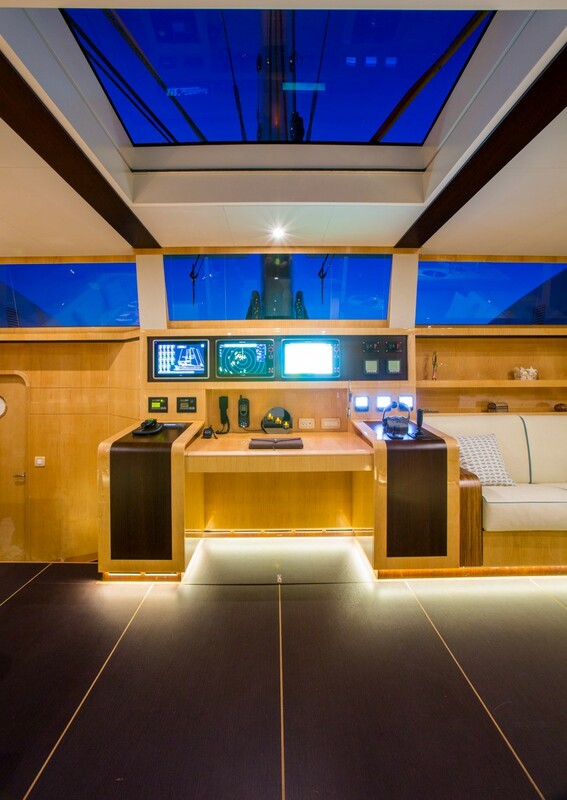 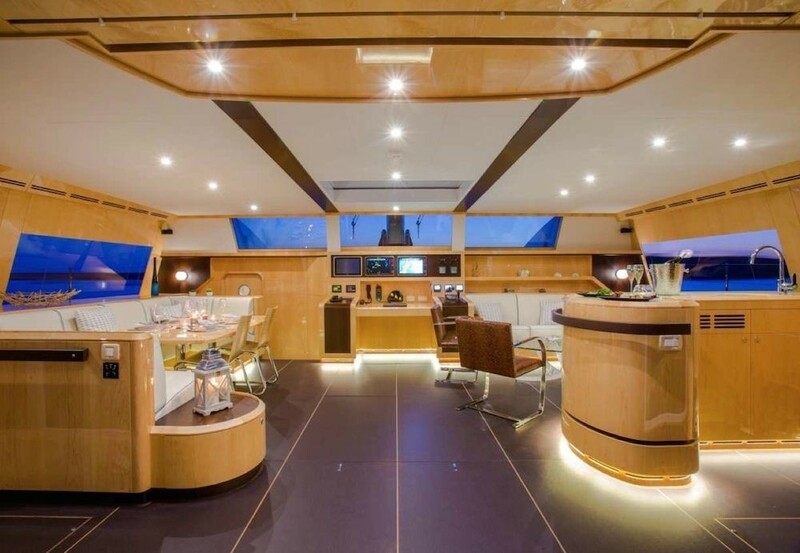 Thanks to the 11.9m (39ft) beam, S/Y WINDQUEST boasts ample areas to relax both indoors and out. 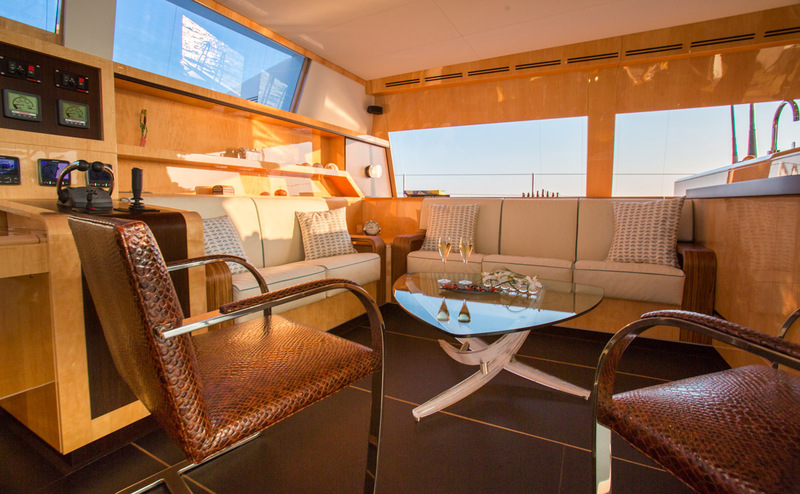 The main salon is raised and can easily open onto the aft deck, creating a spacious entertaining area. 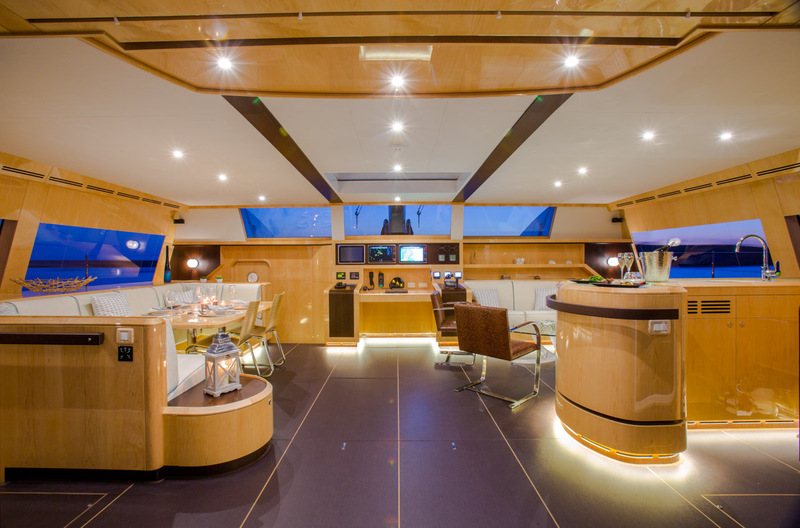 The contemporary and stylish salon is surrounded by panoramic windows and features a lounge and wet bar on the starboard side, with formal dining to port. 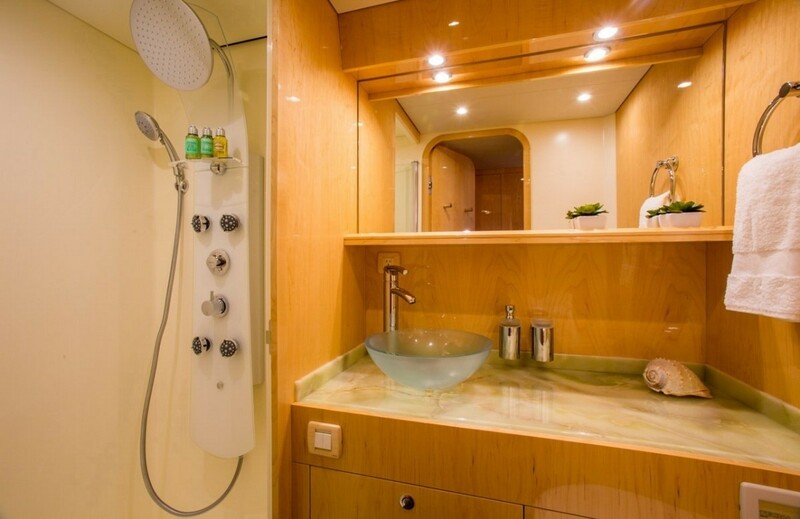 Guest accommodation is in one master suite forward of the salon, 2 guest cabins on the port side and 1 guest cabin on the starboard side. 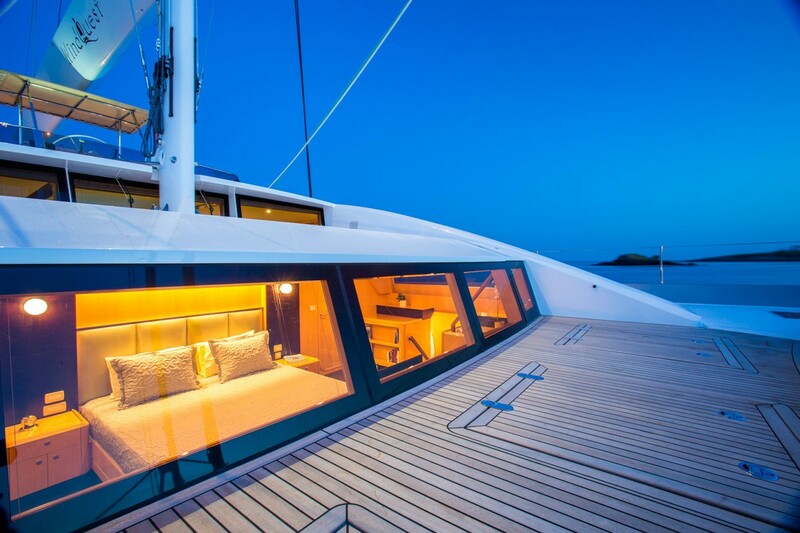 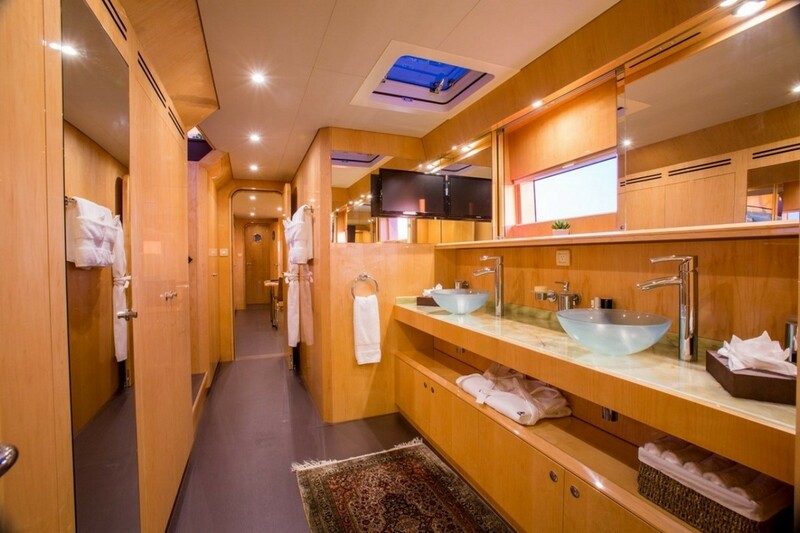 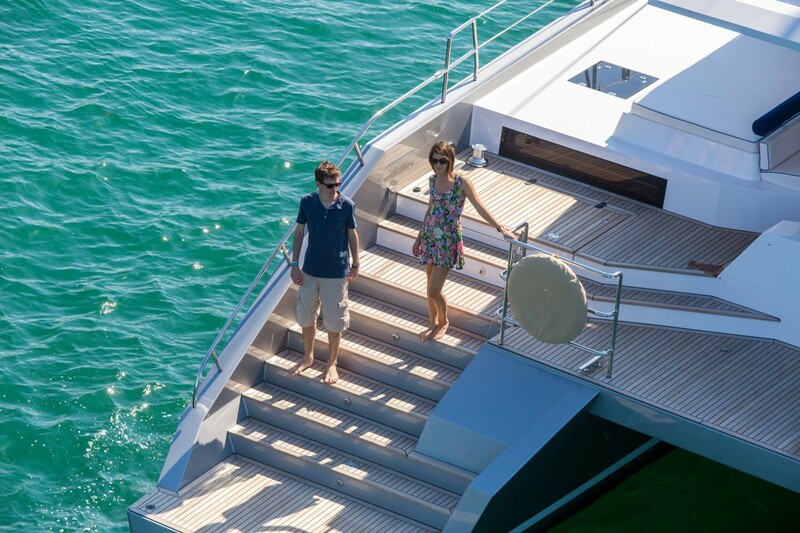 The yachts crew of 4 has private quarters separate from guest accommodation, ensuring optimum privacy. 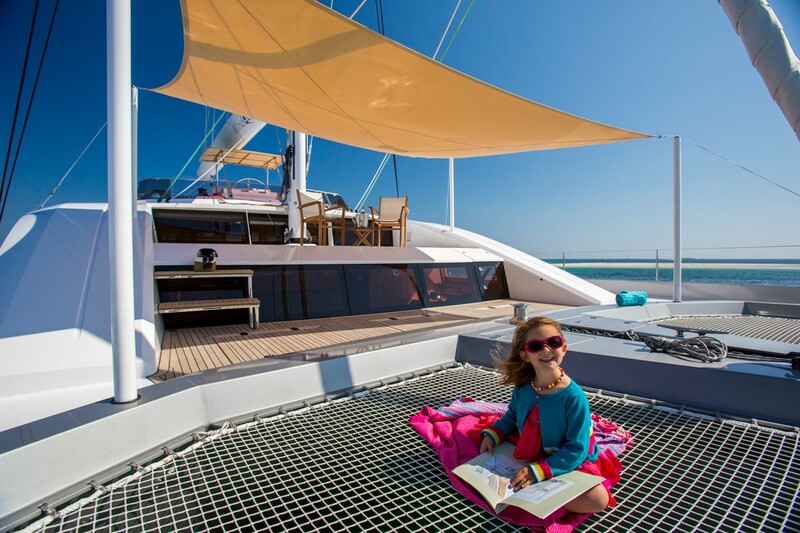 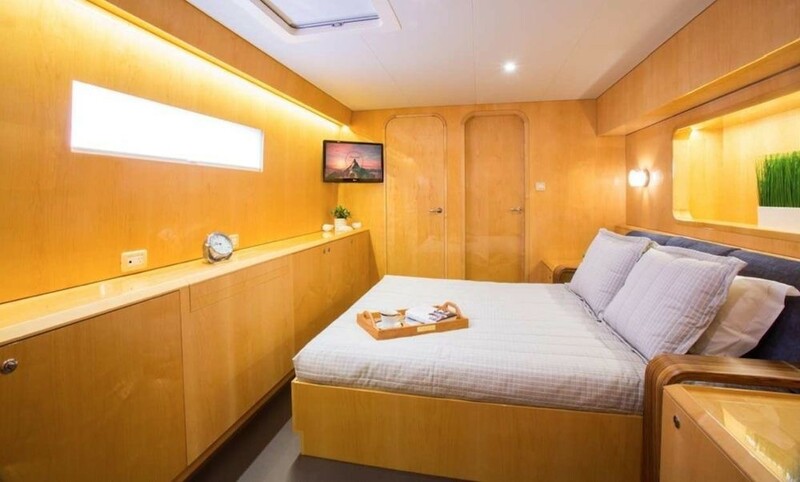 The WINDQUEST catamaran has an abundance of exterior living areas, whether you wish to socialize or retreat quietly with a book. 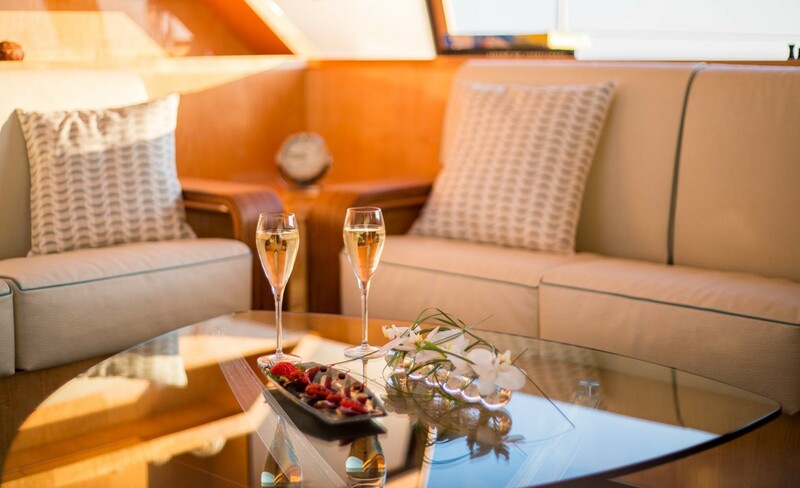 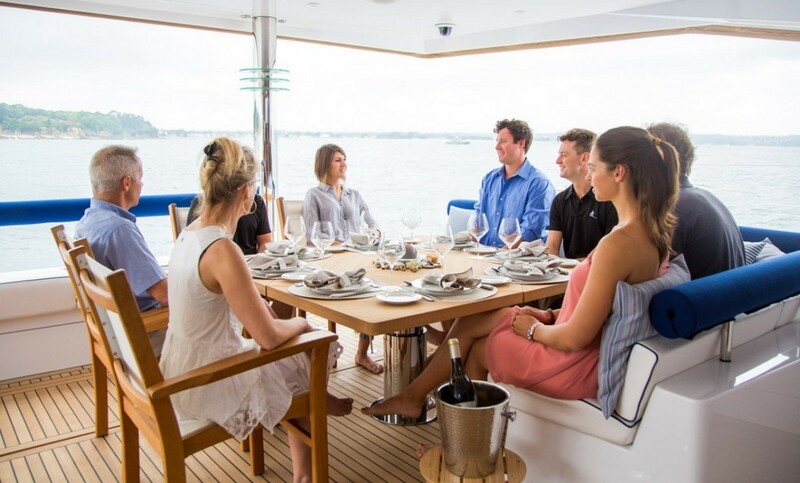 The aft deck is adjacent to the generous salon and boasts ample seating, alfresco dining and sunpads. 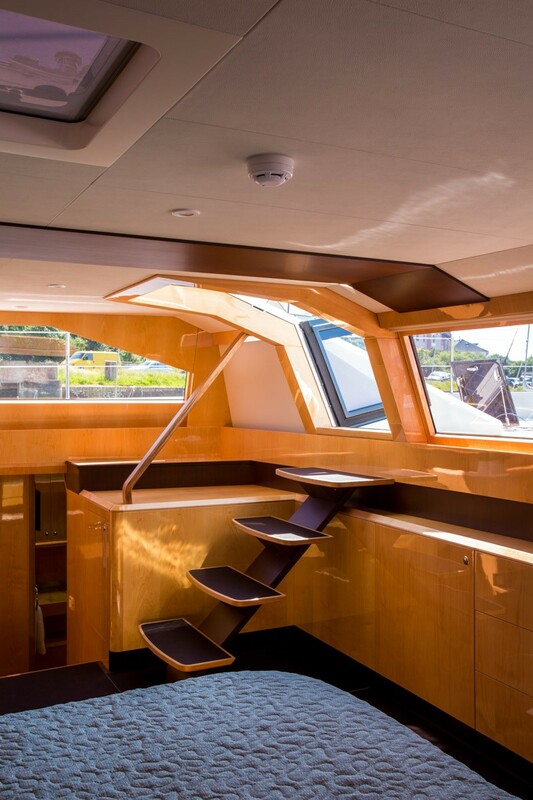 For the water enthusiasts, a walk over aft deck joins the 2 wide transoms and swim platforms, enabling effortless water access. 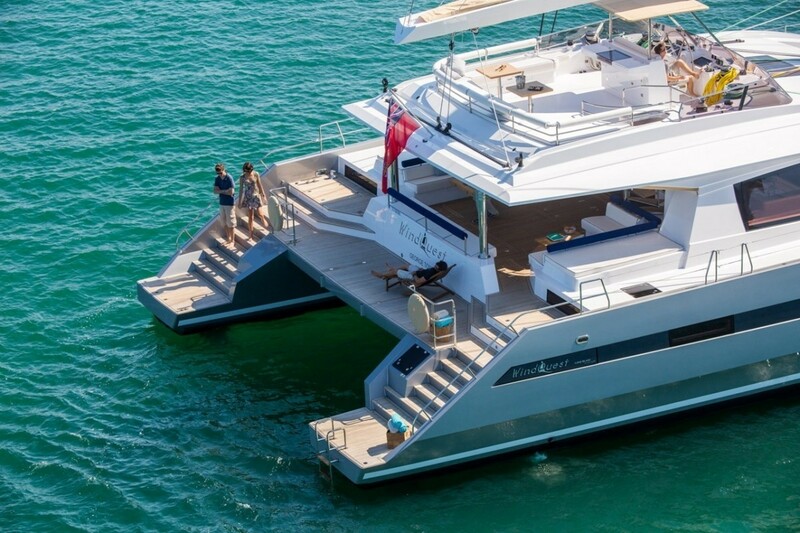 Side decks lead forward to a capacious foredeck, 2 large trampolines and the master suite’s private balcony, which is also accessed directly from the master suite via internal steps. 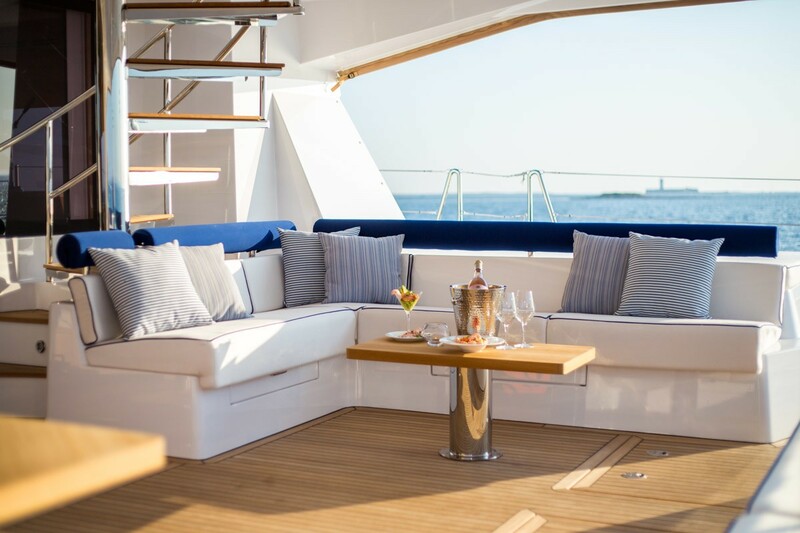 Above the main deck, a generous sundeck is perfect for any occasion, complete with comfortable seating, alfresco dining tables and wet bar. 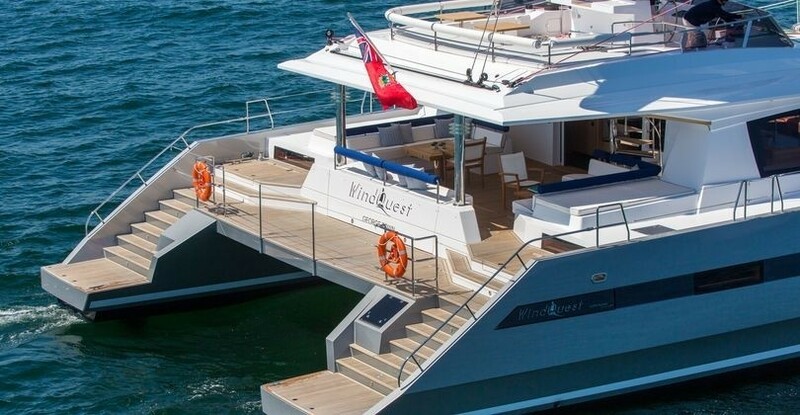 Luxury crewed charter yacht WINDQUEST offers accommodation in 4 en-suite cabins, for up to 8 guests. 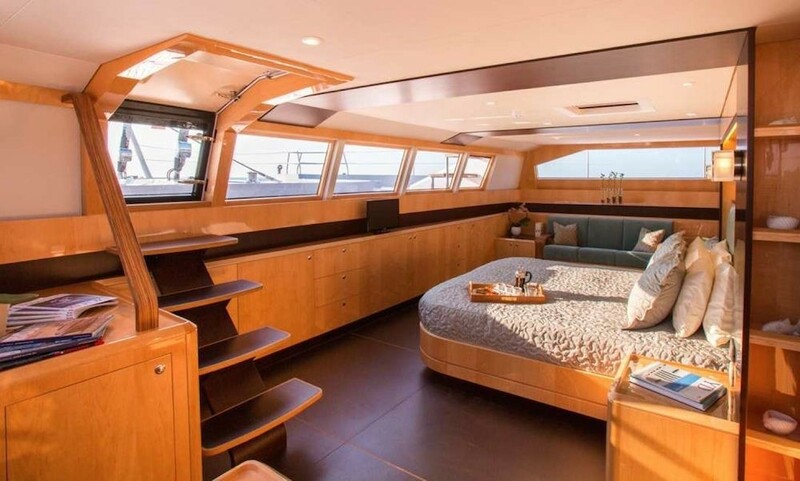 The master suite is forward of the salon, with a center lined king size bed, 180° views, large en-suite with his and hers sinks, TV entertainment, sofa, vanity and private balcony. 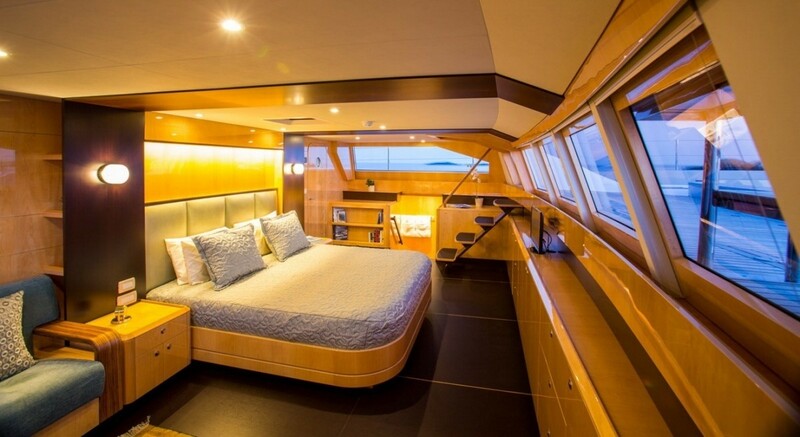 On the starboard side aft, is a guest double with queen size bed. 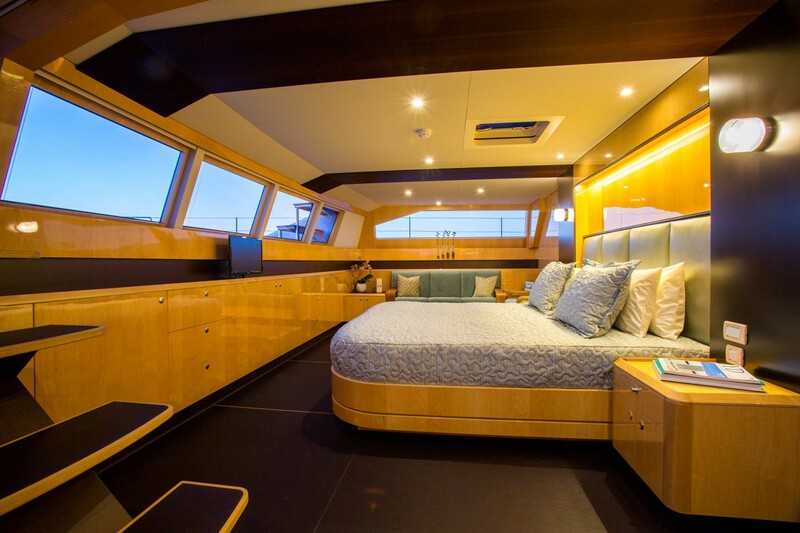 A further 2 guest cabins are on the port side, with a queen size bed each. 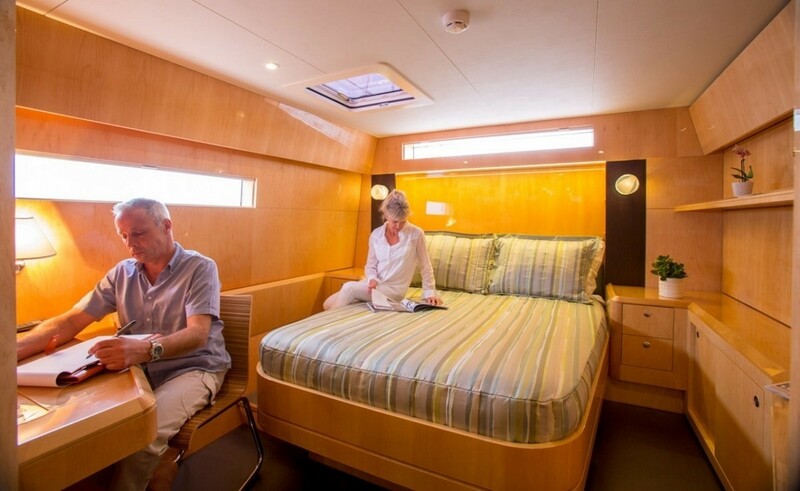 All 3 queen size guest cabins offer TV entertainment. 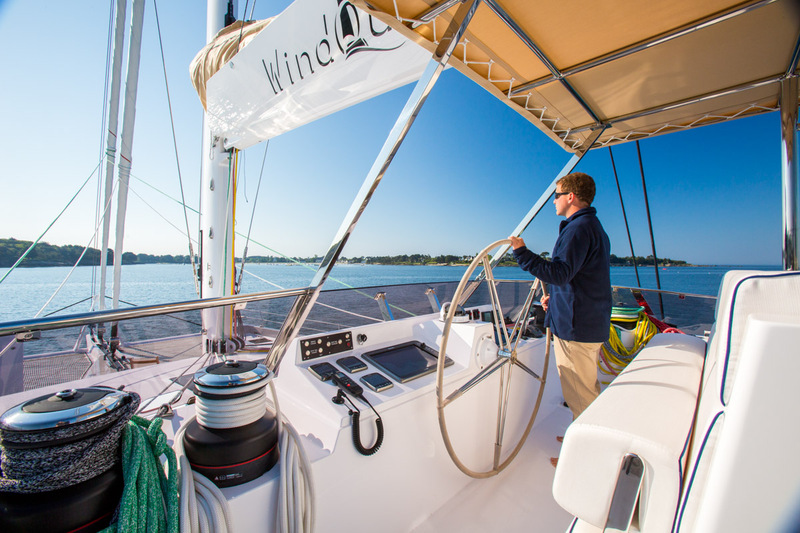 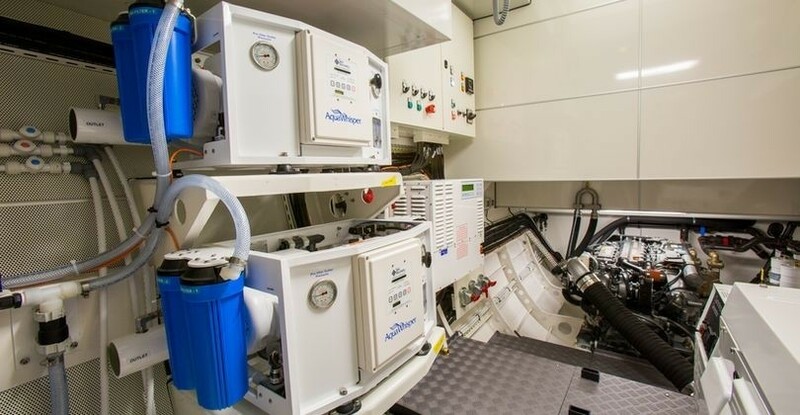 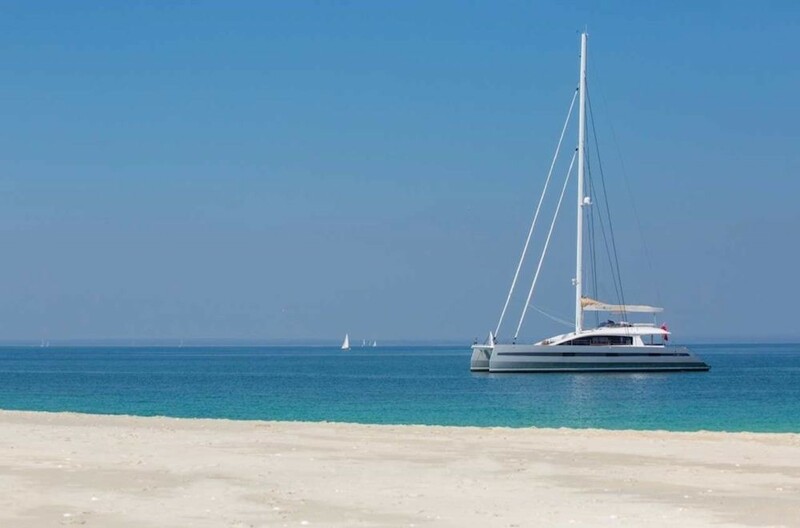 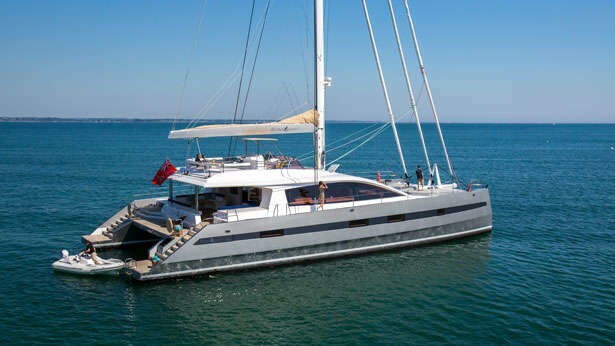 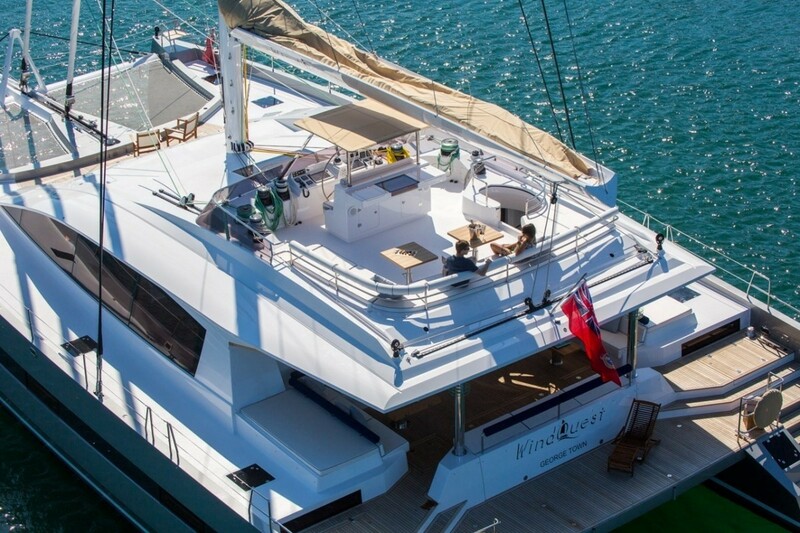 S/Y WINDQUEST is fully air conditioned throughout. 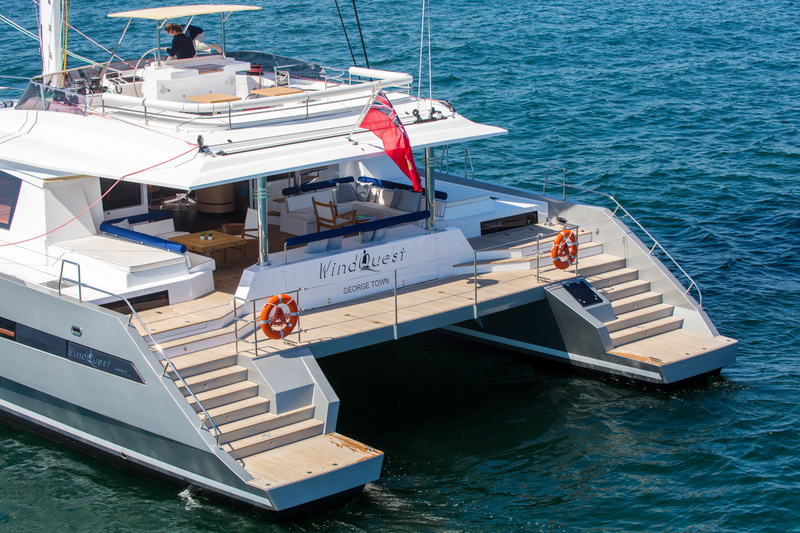 The WINDQUEST sailing yacht has the following Tenders & Toys: ZAR 4.5m 15' tender with 60hp outboard motor, Water Skis, Wake Board, Tube, Kayak, Fishing equipment, Fins, snorkels and masks, 6 person floating bar, Communications include WiFi. 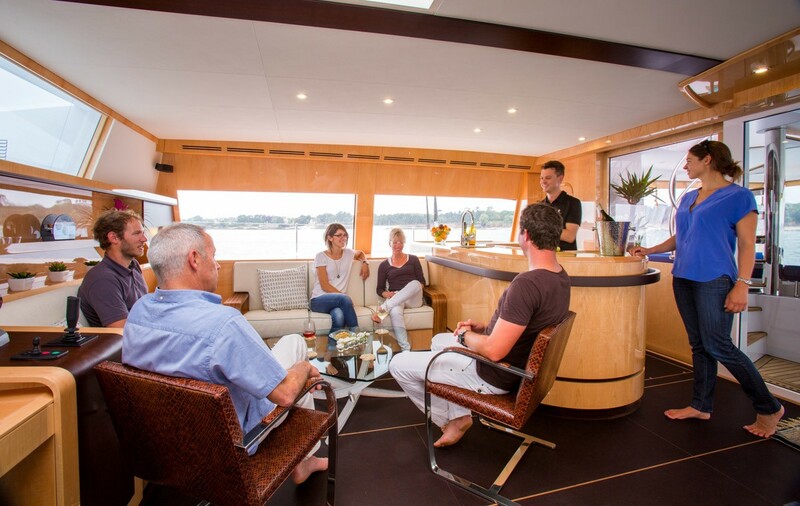 Audio Visual Equipment and Deck Facilities include Apple TV and Apple device based entertainment system. 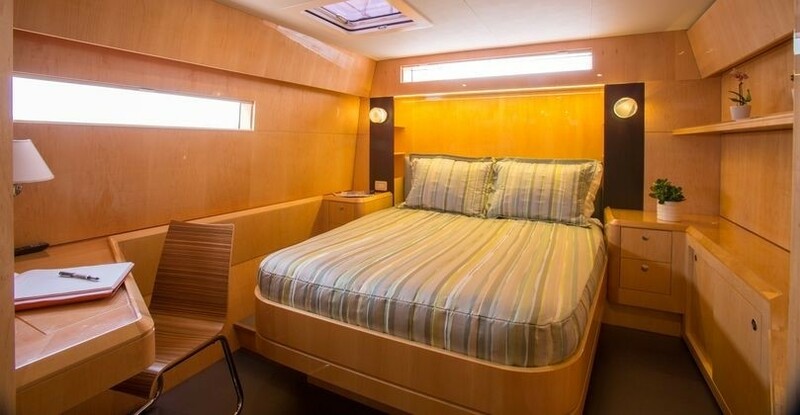 Living room Projection TV, 36" TV and surround sound. 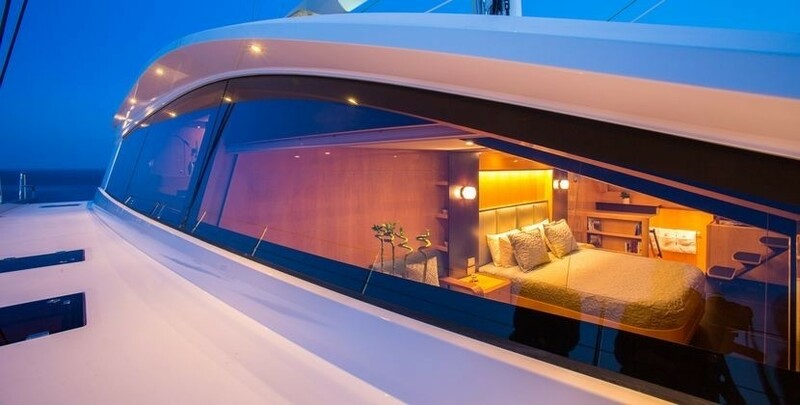 Aft deck Projection TV. 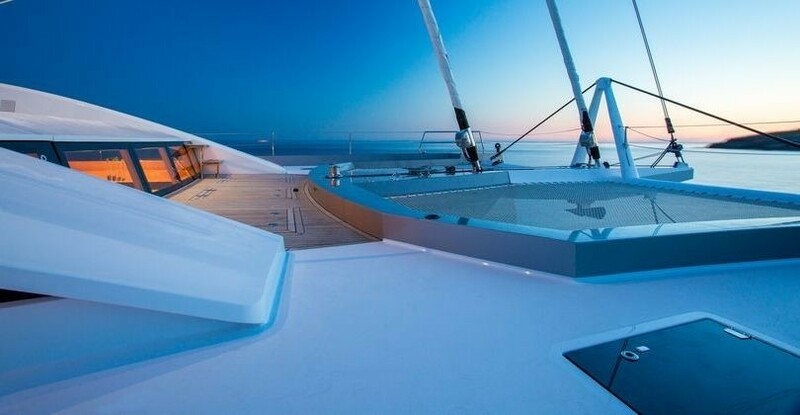 Speakers on sun deck. 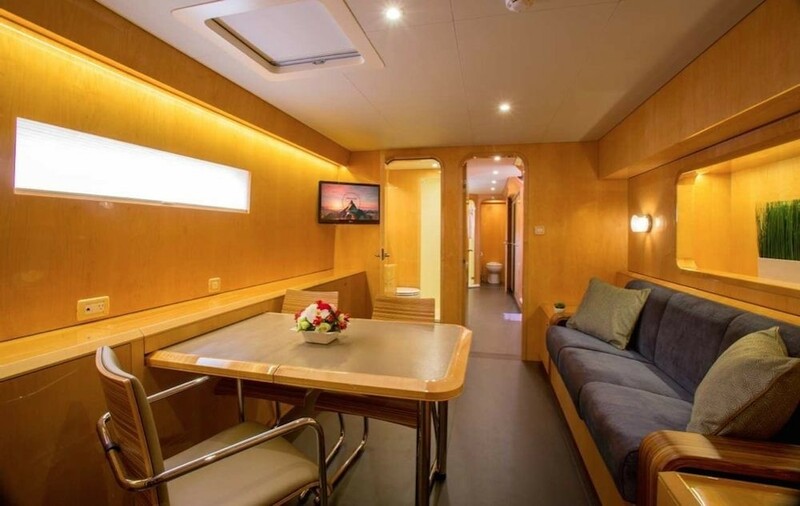 Master cabin has two 24" TVs. Each guest cabin has 24" TV.